First of all, you may be asking yourself what is Live Resin? Well Live Resin is one of the newest ways of extracting concentrates from cannabis. What sets live resin aside from other forms of dab extraction is that it utilizes fresh cannabis plants that were frozen almost immediately after being snipped. The purpose of this is to retain as many of the original terpenes as possible. Terpenes are what contribute to the smell and taste of cannabis and the drier a plant becomes the more terpenes get lost so by freezing the plant instead of curing it leads to stronger aromas and flavor from your extracts. Live Resin has been found to be on average 2% richer in monoterpenes than dabs made with regular non-frozen cannabis plants or trim. 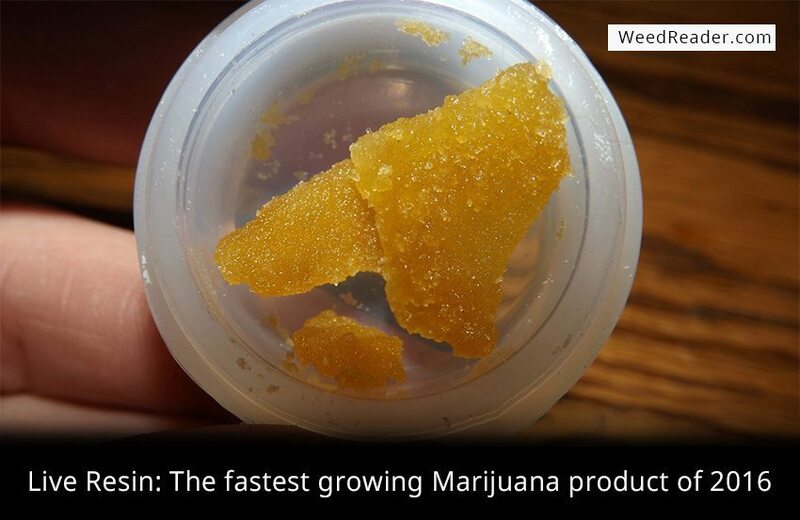 This makes sense of Live Resins place as the number one growing marijuana product of the year. It’s worth noting that live resin is not more or less potent than any other form of BHO. One feature that live resin lacks is the stability that BHO can obtain. The texture and consistency of live resin is different than your typical shatter or wax. Live resin tends to be yellow or light gold in color. Massroots describes live resin as having “a very gooey and granular consistency.” This makes it harder to handle than shatter which can be broken off by hand even at room temperatures when made correctly. Despite this, live resin transactions in Washington went from .3% in November 2015 to .82% by the end of May 2016. The recent rise in the popularity of live resin has led to a mark-up of anywhere from $10 to 50 dollars more than the average gram of concentrate. Concentrates already have a higher profit margin than flower and many other marijuana products and the fact that live resin eliminates the curing phase makes it an extremely appealing product to retailers. While the boost in flavor offers something better for concentrate connoisseurs.